GRID Alternatives Imperial Valley helps make solar savings a reality for everyone, specializing in solar energy installations for low and fixed-income families who couldn’t otherwise afford it, we also help train the solar workforce of tomorrow. We operate in El Centro, Brawley, Westmorland and Calexico. Join us! Become a client, volunteer or make a donation today. 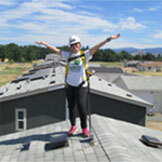 Erica needed employment and wanted to do something positive in her community -- for her, solar was the answer. For Daniel, GRID represented a missing piece in his solar education.